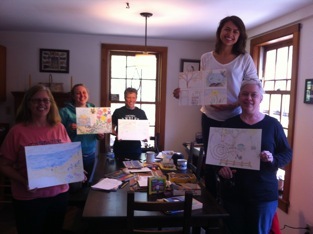 Camp and Create with Annette and Joyce July 13 – 19 – Maine. Ocean. Camping. Annette Fortier and Joyce Hayden will be at “The Shores” next week July 13 – 19 as Artists in Residence! Here’s a note from Annette an Joyce…..
We’re getting excited for our upcoming residency at the Campground. In our earlier post, we mentioned we’d be working on ex-voto “paintings”. Ex-votos are works of art focused on gratitude. They include both images and words. We’ll be offering this as an art and writing project one day during our week. Recently we facilitated a workshop where participants did some writing exercises that led to them creating their own ex votos, using pastels, oil pastels and colored pencils. 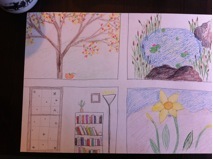 We’ve included some pictures from the day and samples of the finished art works. Themes that people focused on were family, the seasons, camping, and pets. There’s no limit to what we’re grateful for. During our week at Searsport Shores, we will be focusing on connecting to nature and ourselves through observing, drawing, and writing projects. 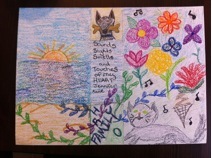 This will include collage, creating nature journals, ex-votos and other related activities. Joyce Hayden is a writer and painter. She teaches English at Westfield State University in MA. She works with oils, acrylics, and watercolor and loves creating collages. Joyce’s work has been exhibited in galleries and specialty stores in MA, OH, and Vermont. Her latest exhibits have focused on ex-voto paintings, which are paintings of gratitude. Annette Fortier works with families and children as a social worker in a nonprofit agency. She also volunteers for The Cancer Connection as a support person for individuals and their families newly diagnosed with cancer. Annette spends her creative time spinning yarn from a variety of fibers and journaling as a daily practice. 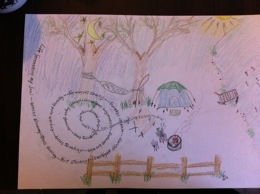 She incorporates nature into the writing and believes nature has many healing qualities and inspires creativity! Annette has facilitated several journaling groups. Journaling can be a very magical process!